At 13875 West 151st Street in Olathe, Kansas, you will find an enthusiastic, friendly and growing congregation of Christians striving to be all that God has called us to be. We are located in the greater Kansas City metro area. Our congregation is served by 5 elders, 2 ministers and 18 deacons, but the involvement of every member is our goal. We don’t believe or practice the cliché that 20% of the people do 80% of the work. 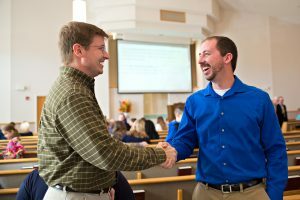 Every member is encouraged to be engaged in ministry. We desire to serve God faithfully in our daily lives and to worship Him as a church body according to biblical guidelines. We believe this can be done in meaningful, relevant ways that may be called “traditional,” but which are much more than formalized rituals. As a “church-planting church” our desire is to reach the greatest number of souls while maintaining both the dynamism and close fellowship of a medium-size congregation. For several years the 151st Street Church of Christ had dreamed of planting a new congregation somewhere in the Kansas City area. Eventually, the dream became a plan and then a work in progress. In the Fall of 2016, Joe Brumfield was hired to lead the development and planting of the congregation that is known as Southpoint. The SOUTHPOINT CHURCH OF CHRIST began transitioning towards being a fully independent congregation by meeting for Sunday worship in our fellowship hall in the summer of 2017. 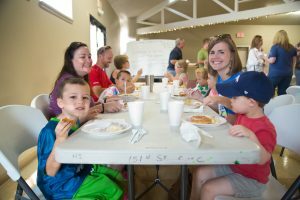 From September 2017 through March 2018, Southpoint worshiped as an autonomous congregation, meeting in an elementary school in Martin City, Missouri. On April 1, 2018, the congregation became the Southpoint Church of Christ on Red Bridge Road, and now meets in its permanent home at 101 W. Red Bridge Road, Kansas City, Missouri. For additional information about the SouthPoint Church of Christ, contact Joe Brumfield at 417-655-0579.